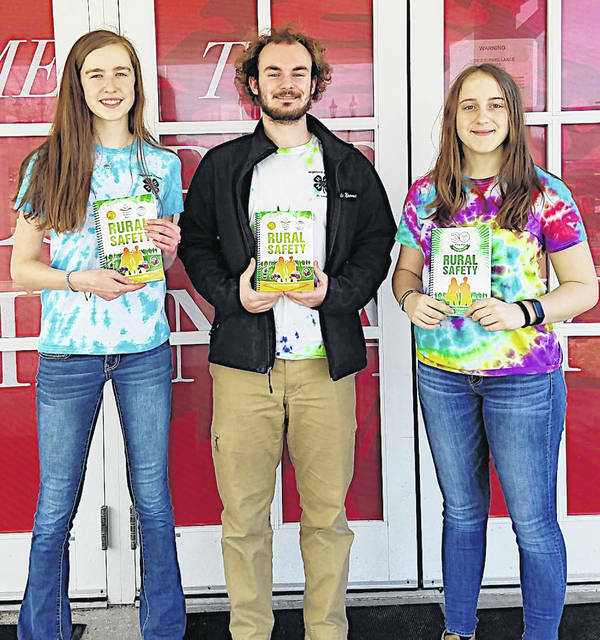 Pictured are OSU Extension Junior Leaders, from left, Sydney Hamilton, Cole Newsome and Trinity Edenfield. In an effort to increase awareness of rural dangers and reduce farm-related accidents, Kathy Bruynis and Danielle Combs, 4-H Youth Development Extension educators, along with Highland County Junior Leadership 4-H Club members taught rural safety to Lynchburg-Clay, Bright Local, Fairfield and Hillsboro third grade students. They targeted safety around animals at the Highland County Fair as well as on the farm. “Rural Safety: Smart choices for LIFE” is a 112-page instructional handbook especially written for children who live and often work on the family farm. Produced by Community Safety Net whose mission is “Protecting kids for LIFE,” this exceptional family resource contains practical information on everything from electricity to safety around animals, and educates children on many aspects of rural safety. The kids received this resource through the support of local businesses and organizations. The National Committee for Childhood Agricultural Injury Prevention estimates that every year across North America, more than 100 children die and another 100,000 are seriously injured in farm accidents. Of those injured, 50 percent do not actually live on a farm — a statistic that underscores the need to provide rural safety education for all children living in rural areas. Community Safety Net is a family-run, values-oriented organization that produces a series of educational safety resources created especially for kids. To date, more than three million children in communities across North America have benefited from CSN material. This was in conjunction with 4-H promotion. For those interested in joining 4-H, the deadline to be in a club is April 1, 2019. For more information contact the OSU Extension Office at 937-393-1918. Submitted by Kathy Bruynis, Extension area leader, Area 22 Extension educator, Highland County.